The tender will drop you off in the center of town within walking distance of the large mosque, the very interesting fish market and local farmer's market. Though Male is the capital of the Maldives and a place where visitors almost exclusively arrive into and leave from the country, it's interesting that many visitors do not spend a single night in Male. This is because most visitors go directly to their resort island and spend most of their time there. For its land mass, Male Maldives is pretty densely populated with around a 70,000 strong population. There are ongoing land reclamation projects in progress to increase the amount of space on the island. Male Maldives, despite being a small city, still offers the kind of services you would come to expect from any capital including books, post office, internet access, bookshop, travel agents, a myriad of eateries and so on. 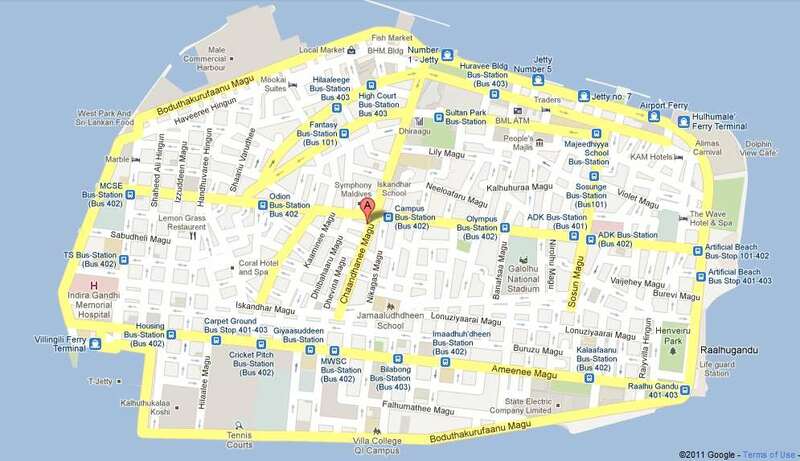 There are a few points of interest for those who venture into Male to get a glimpse of life in the capital. One of the grander structures in the city is the Islamic center and mosque. Hukuru Miskiiy is the most ancient mosque in Male and dates back to the 1650's. There is a National Museum displaying various artefacts once owned by the Sultans - from clothing to weapons. You may also enjoy visiting the Muleeaage (a structure initially built as a palace and also used as presidential residence in the past). The island is 1.7 km long and 1.0 km wide, but with over 100,000 people crammed onto it, Male is by some measures the world's densest city. The highlight of the Maldives, is the beautiful coral atolls and underwater sea life. It is easy to arrange a visit to one of the local islands or a snorkeling trip right at the tender pier for less than $50.00 per person. Any snorkeling here is many times better than anywhere in the Caribbean. The nearest islands are no more than a 20 min speedboat ride away. Major currencies can be exchanged at banks, tourist resort islands, hotels and leading shops. Payments in hotels can be made in most hard currencies (particularly US Dollars) in cash, traveler's cheques or credit cards.